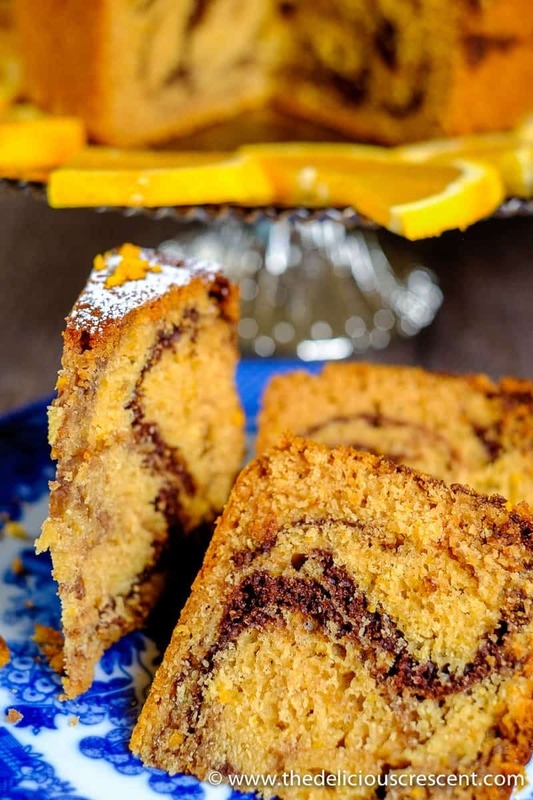 Tahini Orange Chocolate Marble Cake – a moist scrumptious cake with a buttery tender crumb, but with “no” butter and only a fraction of saturated fat! 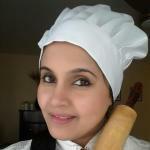 I have been mulling the idea of baking with alternatives to butter, which is a rich source of saturated fat. Now let me clarify that butter and saturated fat can be included in the diet – just that it needs to be done judiciously. There are too many popular and traditional recipes that rely on butter heavily. But times have changed. Peoples’ lifestyle and diets have changed. We are dealing with an increase in preventable chronic disease. So it becomes necessary to learn and utilize more of these alternative recipes. True, that there have been some studies and news articles in circulation saying that saturated fat sources are not any worse and in fact may be better for you. Still, the fact is that professional organizations such as the American Heart Association hold a position that saturated fat should be included in the diet judiciously. This position is based on a rigorous review of multiple studies by a broad panel of experts, and not based on a few random studies or opinions. But when substitutions are made, sometimes it comes with a compromise in taste and/or texture. Oil based cakes have been around for a long time and do taste good in their own way. However, cakes that are prepared using butter are more dense and yet have a tender buttery cake crumb. And when you yearn to have that texture, oil fails to deliver that. I experimented with a mixture of tahini (ground sesame paste) and oil to substitute butter. 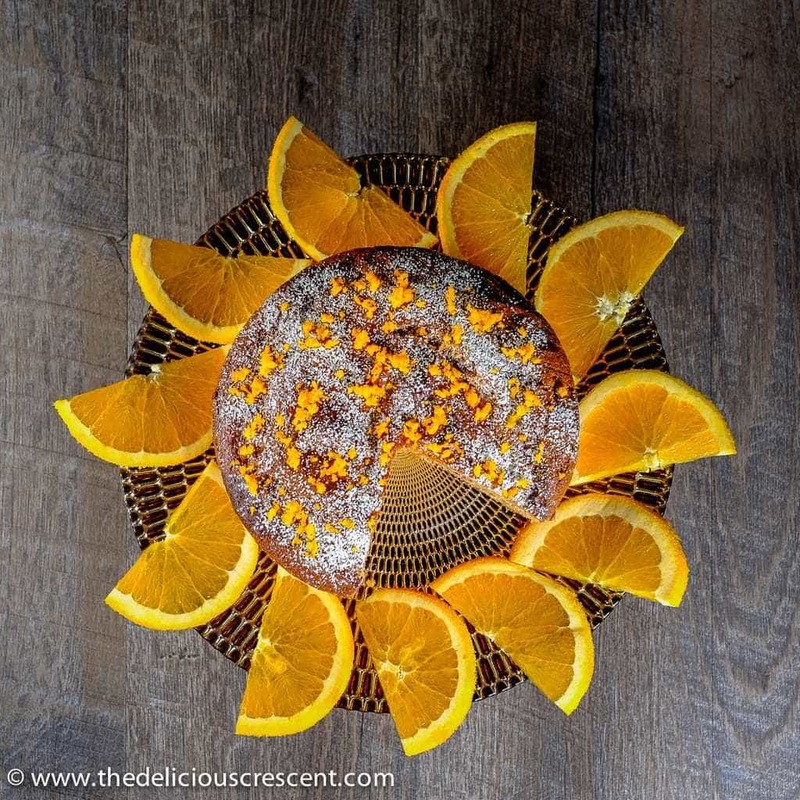 And I was amazed with the results of this Tahini Orange Chocolate Marble Cake . It gave me that exact butter cake like texture. The cake does have a faint hint of the tahini flavor, like some of the Mediterranean tahini based sweet halvas, especially when using orange/orange blossom flavor. But if you prefer, that background flavor can be altered with vanilla extract. And the bonus is that Tahini is well known for its nutritional benefits. It is heart healthy – sesame seeds are a rich source of monounsaturated and polyunsaturated fats, a very good source of magnesium and calcium and an excellent source of cholesterol lowering phytosterols. These super seeds are also a very good source of iron. Research studies have shown the cancer protective and cholesterol lowering effects of the lignans present in sesame seeds – sesamol and sesamin. Here is another favorite recipe which utilizes sesame seeds and where I discuss further about its nutritional benefits – Healthy Persian Barbari Bread. And if you are a cake lover like me, you may want to check out this Light and Delicious German Apple cake. So if you are in the mood to experiment with some heart healthy deliciousness with a buttery feel, explore this unconventional Tahini Orange Chocolate Marble Cake and get ready to be delighted! 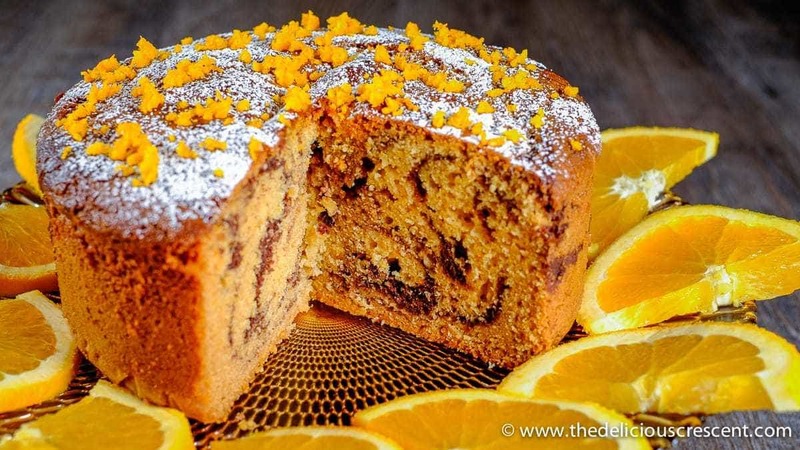 Tahini Orange Chocolate Marble Cake - a moist scrumptious cake with a buttery tender crumb, but with "no" butter and only a fraction of saturated fat! Grease a 8 inch round springform cake pan and set aside. Line the bottom of the pan with parchment paper and if needed the sides of the pan as well. Whisk the tahini with the oil. Add honey, sugar, flavors, salt and beat it until the mixture is fluffy. Add eggs, one at a time and continue to beat. Stir the grated orange rind into the mixture. Sift the flour and baking powder into the mixture and stir it in. Add just enough milk and gently whisk it into a mixture with a slow dropping consistency. Mix the marbling ingredients - cocoa, sugar and milk and stir it into one third of the cake batter. Layer half of the plain cake batter into the greased cake pan. Add dollops of the chocolate colored mixture. Layer the remaining plain cake batter on the top. Gently swirl a fork through the layers to create a marbling effect, but to do not overdo it. Remove the cake pan from the oven. Let it rest a few minutes and release the springform cake pan ring. Let the Tahini Orange Chocolate Marble Cake cool before serving. Oh wow! Never had a cake with tahini in it :) this sure looks scumpticous!! It is actually an interesting thing that some bakers like to try using for baking.